Clam chowder, Boston cream pie and the fresh catch of the day aren’t all these Boston restaurants have to offer. These 5 restaurants bring history, fame, and class to any dining experience, and especially for your student group. Fans of New England style cooking and Boston’s historical roots will be pleased to find the two often combined in many of the city’s renowned restaurants and eateries. A struggle for many student group leaders however, can be finding places to accommodate the large size and variety of tastes of a younger group without compromising on the dining quality. To assist you in this search, we have hand- selected five restaurants that are not only able to hold your group comfortably, but that also offer a unique brand and menu to enrich your students’ experience of Boston and its cuisine. 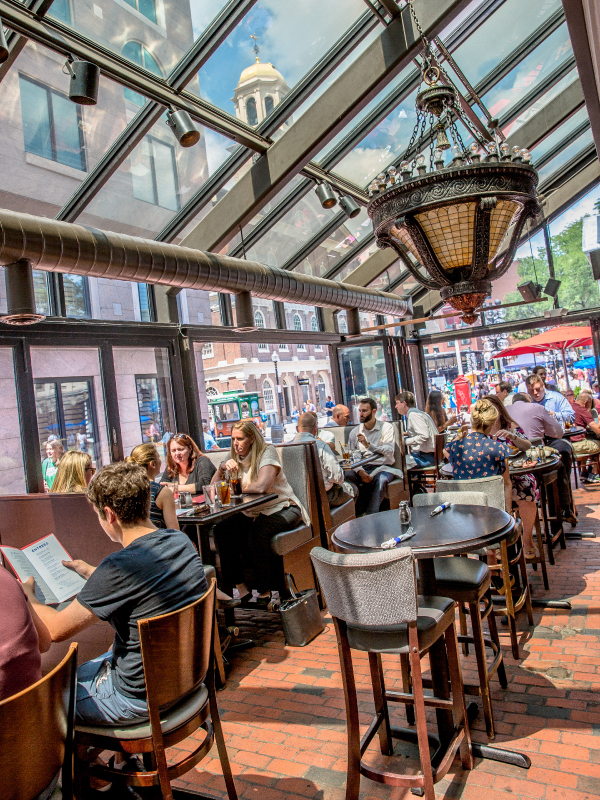 Located in the historical Faneuil Hall, the Anthem Kitchen + Bar is the perfect place to welcome your student group to Boston with a delicious meal in this atmospheric, two story restaurant. The classy yet causal eatery retains its historical ambiance through original brickwork, cobblestone floors, and antique chandeliers. While the first floor features a large greenhouse with windows all around, larger groups can head to the second-floor upper loft to enjoy their private dining on the sun porch. Here your group can enjoy a taste of the New England flavor, including fried pickles, mussels, oysters, fondue, and warm potato chips for starters and dishes such as fish and chips, surf and turf tacos, pizza, burgers, and lobster rolls for the main course. For smaller groups, the Downstairs Lounge and Bar, the Patio and the Upstairs Balcony each seat 15-20 people. For larger groups, the Upstairs Side Room and Upstairs Bar and Central Dining Room options seat 40 and 60 people, respectively. To contact Anthem Kitchen + Bar or make a reservation, visit their website here. 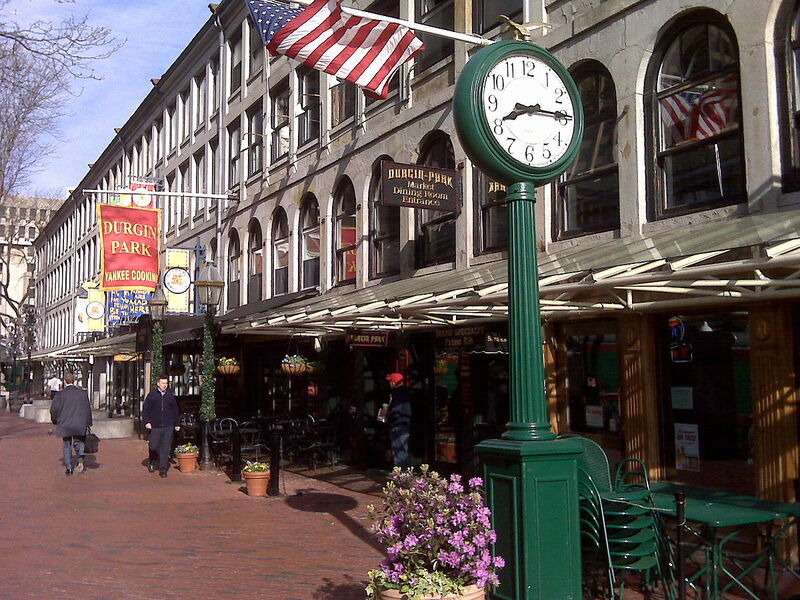 Also located conveniently in Faneuil Hall as its oldest restaurant, Durgin-Park is still considered a classic for locals and visitors alike. Established in 1827 and renamed after the death of two of its original owners, John Durgin and Eldridge Park, the restaurant prides itself on its heritage by serving authentic Yankee cooking in the traditional communal style. Here hungry guests will be treated to classic New England fare of clam chowder, Indian pudding, Boston baked beans, aged prime ribs, steaks, shanks, fresh seafood, and more, all cooked following age-old recipes that date back to the Civil War. Promising to accommodate parties of all sizes, Durgin-Park has private dining options in its spacious third-floor Peter Faneuil Room. Interested groups can learn more about booking a private reservation here. Take a walk down memory lane when you step into what was once known as the local hangout by the name of Bull and Finch Pub, now renamed Cheers after the famous TV show it inspired. 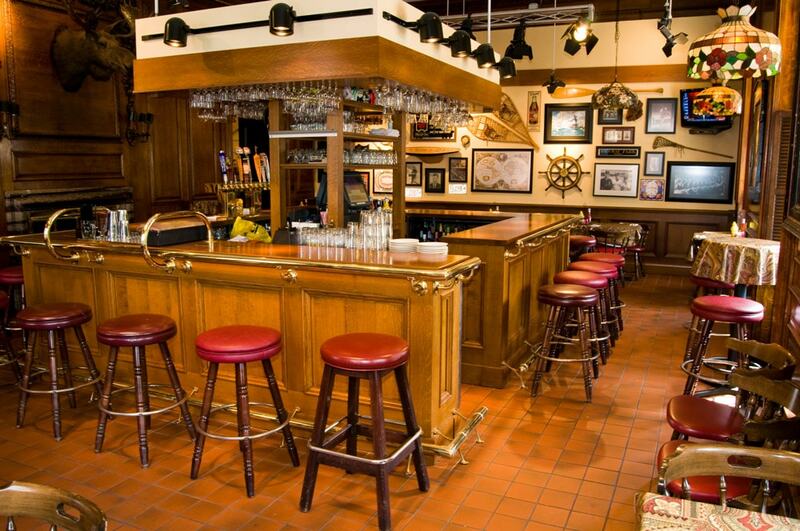 Whether you visit the original 1895 building in Beacon Hill or the 2001 replica in Faneuil Hall, Cheers is a favorite for both locals who have been patronizing the bar since its inception and visitors who come to experience the atmosphere of one of America’s most beloved sitcom shows. 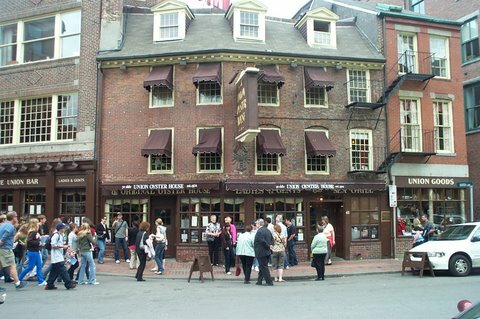 Despite its identity as a bar, Cheers welcomes student tour groups of a minimum of 15 people at both of its locations, accommodating up to 50 at Faneuil Hall and 65 at the Beacon Hill location. The restaurant just asks that diners under 21 years of age leave the restaurant by 10pm before the patronage turns older. To entice a variety of taste buds, Cheers offers several menu options for tour groups to choose from, including a Boston Menu, Bull Menu, Finch Menu, Melville Menu, Cheers Menu, Totally Teen Menu and a New England Menu. Visitors to Boston can’t miss experiencing this perfectly preserved dining experience that captures the epitome of the famed Boston liveliness and character. To book a reservation for your student group, submit an inquiry here. Travel back in time to 1826 when you dine at Union Oyster House, the oldest restaurant in Boston and the oldest restaurant in the U.S. still in continuous service. Serving as a reminder of the city’s colonial days, the Union Oyster House maintains its typical Revolutionary War-era decorations and feel, attracting visitors with both the enjoyable, traditional New England fare and the historical dining experience. Recognized as a National Historic Landmark and one of John F. Kennedy’s favorite stops in Boston, this restaurant has the honors and awards to prove its legacy of culinary excellence before you even take a bite. The Union Oyster House is able to accommodate groups of 20- 250 people in the Private Function Rooms or the Private Dining Rooms. Private Function options include the Webster’s Den, which seats 75-125 people with a minimum of 50 and the more intimate Freedom Trail Room, which seats 35-50 people with a minimum of 25. For smaller groups, the Private Dining Options of 37 Union and Capen’s Coft each seat 20 people. To explore each room’s distinct personality, view a sample menu, or contact the Dining Room Manager, visit the Union Oyster House’s website. After a long trip of sightseeing, performances, and making memories, treat your group to the finest dining Boston has to offer: Grill 23 & Bar. Beloved as Boston’s best steakhouse for over 30 years, Grill 23 & Bar is sure to provide an unforgettable dining experience for you and your group. Exuding class and elegance, this restaurant’s world-class service and food doesn’t stop at the second floor, where guests can enjoy their meal and company in one of the restaurant’s private dining rooms. Grill 23 & Bar has rooms to accommodate anywhere between 10 and 140 guests. Room options include the Alcove, which seats 10, the Trading Room, which seats 18, the Wine Room, for 20 people, the Exeter Room, seating 26 guests, the Fairfield Room, for 32 guests, the Dartmouth Room, which seats 38 and the Clarendon Room, which seats 40 guests. Larger parties of up to 140 people can also request to buy out the Full Suite. Commemorate your stay in Boston with a meal at this award-winning restaurant by contacting Grill 23 & Bar through their website.